A communication drop-out has delayed a Christmas delivery at the International Space Station. 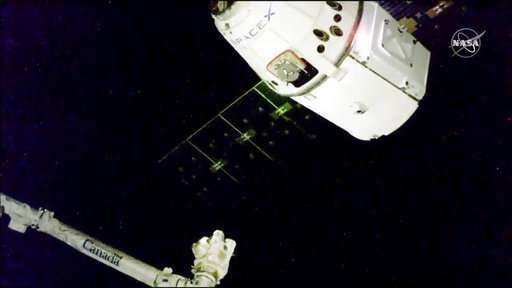 A SpaceX capsule full of holiday goodies got to within 32 feet (10 meters) of the orbiting complex Saturday. But trouble with a communication satellite network forced a last-minute delay. For safety, Mission Control ordered the Dragon capsule to back up to the 100-foot (30-meter) point. Communication temporarily dropped out, meanwhile, between the space station and ground controllers. NASA says there's no reason to think the Dragon still can't berth Saturday, three days after launching from Cape Canaveral, Florida. The trouble is with equipment in New Mexico that serves the Tracking and Data Relay Satellite system. NASA is switching to another TDRS (T-driss) satellite, to get around the problem. NASA components have so much redundancy built in that I'm sure they find a way around this.